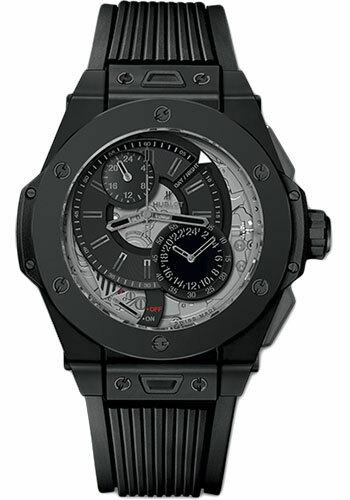 45 mm microblasted black ceramic case, microblasted black ceramic bezel with black composite resin lower, sapphire crystal with anti-reflective treatment, multilayered sapphire and mat black dial, HUB 5003 manual-winding movement, approximately 72 hours of power reserve, black lined rubber strap, black-plated titanium deployant buckle. Water resistant to 30 m.
45 mm polished and satin-finished titanium case, polished and satin-finished black ceramic bezel, black composite resin lower bezel with 6 H-shaped titanium screws, sapphire crystal with anti-reflective treatment, multilayered sapphire and mat black dial with satin-finished rhodium-plated appliques, satin-finished and microblassted rhodium-plated hands, white luminescent on appliques and hands, HUB5003 manual-winding movement with alarm and GMT functions, approximately 72 hours of power reserve, black structured lined rubber strap, titanium deployant buckle with black ceramic insert. Water resistant to 100 meters. 45 mm polished and satin-finished 18K King Gold case, polished and satin-finished black ceramic bezel, black composite resin lower bezel with 6 H-shaped titanium screws, sapphire crystal with anti-reflective treatment, multilayered sapphire and mat black dial with satin-finished gold-plated appliques, satin-finished and microblassted gold-plated hands, white luminescent on appliques and hands, HUB5003 manual-winding movement with alarm and GMT functions, approximately 72 hours of power reserve, black structured lined rubber strap, titanium deployant buckle with black ceramic insert. Water resistant to 30 meters.